A long stretch of silver sands, cool sea breeze whispering through towering Cajurina plantations on the beach, Fishermen seen launching their traditional boats and nets daily into the sea is an interesting feature to watch on this beach. MTDC has a luxury resort around the beach, inviting tourist to experience something unusual-staying. Two house boats are constructed in back water with luxurious facilities. Get thrilling Experience of Water sports. Be cautious while entering the sea for swimming. With its sprawling coastline, Takarli has become the perfect place for water sports. The youngster in the locality who are originally from fisherman community, offers you speed boat ride, water-skiing, banana bump rides, dolphin spotting rides. Next, move to snorkel, scuba dive, para-sailing, paragliding, camel ride, horse ride and so on. Tarkarli is about 35 kms off the NH 17 from Kudal just before reaching Sindhudurg town. 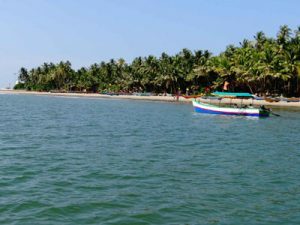 Tarkarli shot into fame after Maharashtra Tourism Development Corporation(MTDC) started the beach resort in Tarkarli and declared Tarkarli as one of the premiere beach destination in Maharashtra. Now MTDC has made houseboat facility available at Tarkarli. Four houseboats are at the service of discerning traveler. These fully equipped luxury boats have the Hi-tech equipment and all luxurious amenities on board. Tarkarli is about 35 kms off the NH 17 from Kudal just before reaching Sindhudurg town. Get thrilling Experience of Water sports. A beach tour make your holiday perfect.